At the site of a plantation where abolitionist Frederick Douglass once lived, University of Maryland (UMD) archaeologists have uncovered striking evidence of how African and Christian religious beliefs blended and merged in the 19th century. The team dug up an intact set of objects that they interpret as religious symbols—traditional ones from Africa, but mixed with what they believe to be a Biblical image: a representation of Ezekiel's Wheel. "No one has found this combination before. It may give us a snapshot of the blending of religious symbols of a tenant farmer after 1865," says University of Maryland archaeologist Mark P. Leone, who led the team. "Christianity had not erased traditional African spirit practices; it had merged with them to form a potent blend that still thrives today." From the late 18th century, Methodist Episcopal, and later African Methodist Episcopal (AME) preachers successfully ranged Maryland's Eastern Shore carrying the Christian message, Leone explains. They converted African Americans to Christianity, in part, by giving new meaning to traditional symbols. A powerful West Central African spiritual symbol—the cosmogram, a circle with an X inside—may have fused with Ezekiel's blazing chariot wheel. Uniquely, the discovered array contains both. "We call this the 'emergent wheel' because it shows the growing power of Christian imagery alongside the African," Leone says. "It shows us a moment in time when these symbols literally lived side-by-side." This is the latest archaeological find from a decade-long excavation at Wye House, the site of a former plantation near Easton, Maryland. Douglass spent two years there as a child and wrote extensively about his experiences and observations. The new discovery helps flesh out these vivid descriptions of African-American life. Two of Leone's University of Maryland graduate students—Benjamin A. Skolnik and Elizabeth Pruitt—made the discovery and excavated the deposit. They found it intact just below the surface where a tenant farmer's home once stood and dated it to 1865-1880. 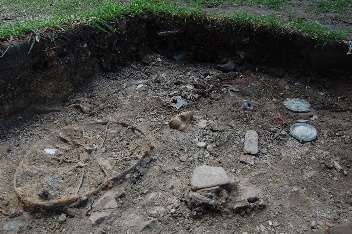 The deposit contains a cosmogram-like figure molded into the lid of a canning jar, surrounded by a series of circles, and a wheel—probably the remnant of a small cart or barrow. Leone says the wheel was unexpected and that he had never seen one in a setting like this. After four years of inquiry, consulting existing scholarship and working with current Eastern Shore residents, he ultimately concluded that it represented something new—the image described in the Book of Ezekiel of a flying chariot. Christian preachers had discovered the powerful resonance the wheel image held for African Americans and over time, the old symbols took on new meaning as the church successfully reinterpreted them, Leone says. Current AME and Methodist Church members told Leone that Ezekiel's wheel represents God's presence among his people. Carlene Phoenix, a descendent of the Wye House Plantation enslaved community, still lives and worships in the area. She says the wheel retains its Christian symbolism and power, even today. "For me the wheel is all about the presence of God. He is omnipotent and is anywhere and everywhere at all times," Phoenix sys. "No matter what our ancestors endured during their captivity, God was there. For me the wheel was a reminder to them about the presence of God and the reassurance that no matter what we endure that He will never leave us nor forsake us." "Ms. Phoenix closes the circle for us in a way," Leone says. "The meaning has changed, but the old symbol retains its power." 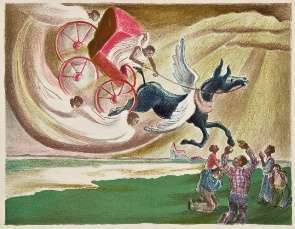 This symbolism of the chariot wheels shows in the work of Ruth Starr Rose, a 20th century painter who lived within walking distance of Wye House. Art historian Barbara Paca, who closely studied and wrote about Rose's work, is credited by Leone with teaching him the meaning of the rusted wheel in the archaeological deposit. It signaled to him the transformation from African religion to African American Christianity. Paca is guest exhibition curator of: Ruth Starr Rose (1887-1965): Revelations of African American Life in Maryland and the World at the Reginald F. Lewis Museum of Maryland African American History & Culture in Baltimore. Did middle class blacks abandon hoodoo?